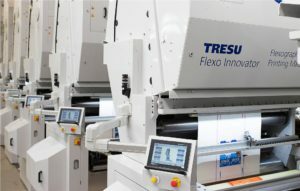 Advanced flexo solutions including Flexo Innovator paperboard printing line will highlight at TRESU’s debut appearance. TRESU Group will be presenting its Flexo Innovator press and ink supply solutions for brand owners and board, flexible packaging and label converters at its début appearance at Fachpack 2018, 25-27 September, Messe Nürnberg, Nuremberg Germany. On its stand (Hall 8, Stand 8-304) will be information, animations and samples that demonstrate the TRESU Innovator inline press for advanced, high-quality, high-speed packaging production and exhibits of its value-adding, performance and quality improving ancillaries. 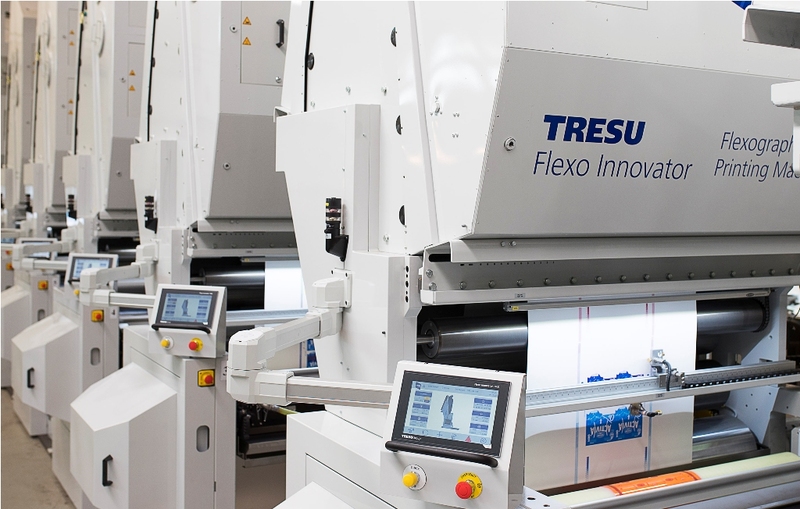 Designed for the needs of brand owners and packaging converters, the Flexo Innovator is the result of TRESU’s own research and developmentand exceptional engineering, to deliver the shorter runs, higher quality, and fast turnarounds needed to compete in today’s market conditions. TRESU’s Flexo Innovator, a complete printing line and coating system for high-value packaging applications, combines outstanding print quality, high-speed production and fast job changes with ergonomic design and sustainable printing. Available in web widths from 670mm to 1700mm, the Flexo Innovator is a custom-configured, multi-process inline printing and converting press for folding carton board, paper, laminates and metallic substrates. An efficient single-pass alternative to labour-intensive central impression presses, the Flexo Innovator is able to integrate water-based, solvent and UV-curable inks. It also offers additional high-end complementary processes including double-sided printing, gravure coating (double-sided), inkjet, cold foil lamination and converting, in a single operation. High-speed unit-to-unit drying, automatic ink supply and sleeve systems are features of this stable, efficient platform that is capable of speeds up to 800m/minute. The low-level inline architecture means that all units are easily accessible and that make-ready preparations can be made on unused units while the press is running. The ability to handle multiple processes means that time is saved in transferring materials to off-line finishing equipment, and the risk of handling damage is reduced. With environmental concerns a high priority of brand owners and converters alike, the TRESU Flexo Innovator has been designed for sustainable production. Features that reduce substrate and ink waste, energy and emissions, reduce the press’s environmental footprint and demonstrate TRESU’s commitment to sustainability. Also exhibited at the stand will be TRESU’s ancillary solutions, comprising chamber doctor blades and ink supply systems. These provide enclosed, automatically controlled ink and coating circulation, resulting in clean print, uniform ink density, reductions in material waste and makeready times, and faster production speeds. TRESU’s chamber doctor blade systems feature a long-life rubber seal system that provides an airtight enclosure, preventing leakage and enabling ink pressure to be maintained at consistently high levels. This in turn eliminates microfoaming. Fast, safe blade exchange comes as standard. The chamber programme, available for widths between 185mm and 6000mm, includes lightweight, corrosion-resistant carbon fibre and ceramic variants. For web widths from 1600mm, the new MaxiPrint Concept chamber features an integrated cleaning. The SAVEink chamber is suited for widths up to 800mm. The F10 iCon ink supply system regulates ink flow, pressure, and viscosity, to ensure a constant, accurate ink density on the printed substrate, without any air contamination. It also provides thorough automatic cleaning and fast automatic ink changes. There will also be information on TRESU’s coating systems for integration with sheet-fed digital folding carton printing presses. These apply added-value full-surface and spot coatings as well as metallic embellishments directly after the printing stage. The TRESU Pinta is available for Xerox iGen presses, and the TRESU iCoat 30000 is designed for use with HP Indigo 30000 digital presses. TRESU supports these workflows with a comprehensive range of consumables such as varnish media, tapes and sleeves, as well as cutting equipment, thereby covering every element in this coating workflow.